Golak Bugni Bank Te Batua movie has released another amazing track ‘Selfie’ from the upcoming Punjabi movie. The Selfie song is sung by Gurshabad and music given by Jatinder Shah. The movie Golak Bugni Bank Te Batua is yet to be released on 13th April, 2018 worldwide. Apart from Selfie song, the first song ‘Aisi Taisi’ from the movie liked by everyone and received a lot of appreciation. 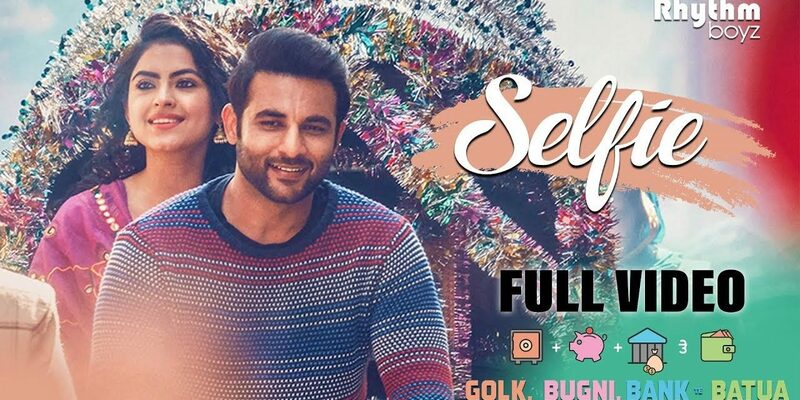 The Selfie song is surely going to be another hit song from the Golak Bugni Bank Te Batua movie. After the release of the hysterical trailer and a romantic Punjabi song, the upcoming Punjabi movie Golak Bugni Bank Te Batua has recently released its first dance song ‘Selfie.’ The movie is already making news due to its unusual title. The story of the film is also quite different than other Punjabi movies. It is based on the financial effects of Demonetization, which definitely sounds to be a fresh and interesting concept. The movie has already created a buzz on social media before its release. Let’s hope the movie can live up to it. The new Selfie song features the female lead Simi Chahal performing at a Mehndi-Sangeet function. Her dancing moves are simple yet charming and Harish Verma, the male lead is admiring the bubbly girl simultaneously. The new dancing song is surely going to make you shake a leg to its tune. Moreover, the lyrics are catchy and filled with fun and tease. The voice behind the Selfie song is of Gurshabad and music by Jatinder Shah. Sidhu Sarabjit has written the lyrics of the song. Scheduled to release on 13th April 2018, the movie Golak Bugni Bank Te Batua is a comedy-drama, featuring Harish Verma, Amrinder Gill, Simi Chahal, Aditi Sharma, B.N. Sharma and Jaswinder Bhalla. To enjoy this amazing Selfie song, simply click the play button on below video. Stay tuned to Att Manoranjan and we’ll be pleased to keep you posted about the latest news and movie updates.